You can’t deliver on your strategic plans if you aren’t crystal clear on what exactly you want to achieve and, in turn, what areas of your business you need to focus on to achieve those aims. Having spent many years working with companies and governments big and small to develop successful strategies, I believe the most valuable strategy tool is a clear and concise one – preferably a single-page document that absolutely anyone in the company can easily understand. To help businesses create their one-page strategy, I’ve developed the SMART Strategy Board. It’s divided into six simple sections, which form the six critical areas that every business strategy should cover. 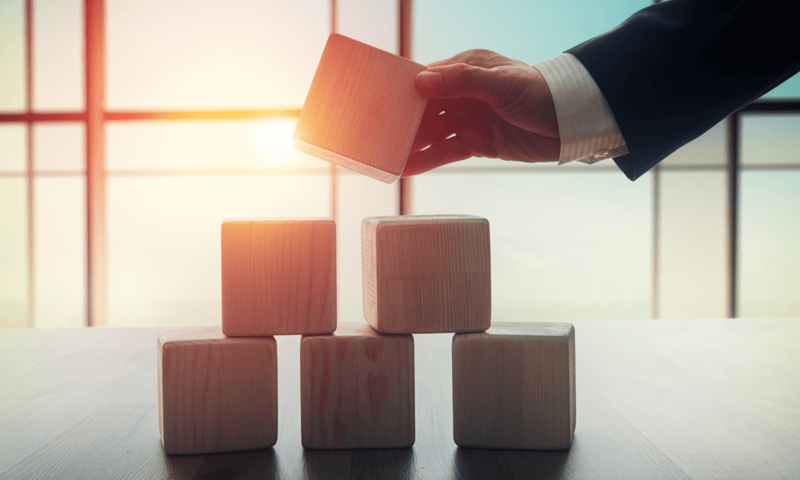 In this section, you need to set the scene and provide an overarching context for your strategy by laying out, in simple terms, exactly what your business is aiming to achieve. A good way to do this is by including your purpose and ambition statements. These are two different statements, fulfilling different jobs. Your purpose (or mission) statement should be a brief, simple statement that neatly encapsulates why your business exists. 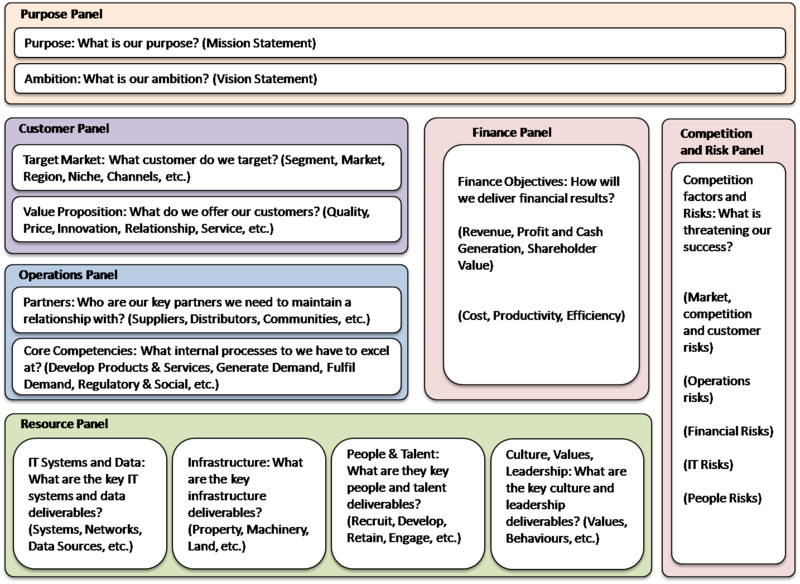 As the name suggests, it answers the question, “What is our purpose?” A mission statement is usually intended for internal use. It communicates your company’s intentions, motivates internal stakeholders, and defines what success looks like for your company. It should include your target audience, what services or products you deliver, and what makes your offering unique. An ambition (or vision) statement defines what the organisation wants to achieve in the future, it spells out the destination of where the company is heading. Available to both internal and external stakeholders, a vision statement sets out your ambitions in an inspiring way. A good vision statement should inspire employees to perform at their best, inspire customers to choose you over your competitors, and inspire shareholders to invest in the business. This section is about understanding your customers, specifically: what you already know about them, what you don’t yet know, and what you need to find out if you’re going to successfully deliver your strategy. This falls into two key strands: your target market and your value proposition. First you need to set out who your target market is. For example, are you targeting a particular segment, geographic region, or demographic? Define exactly what you need to know about the target market in order to improve your chance of success. Next you need to clarify your value proposition, which means what you offer your target market. Essentially, you need to define why customers will choose you. Is it because of quality, innovation, customer service, price, or something else? In this section, you need to clearly set out the company’s financial goals and ambitions. What is your business model? How will your strategy generate revenue? What are your specific revenue goals? What about profit, cash flow and growth goals? Also, you should consider how you are going to finance your strategy. It’s vital you have the funds to properly see your strategy through. This section naturally follows the “customer” panel, since pinning down your market and value proposition will help you define exactly how you’ll drive revenue growth and profit. Here you need to carefully consider your operations or the things you need to focus on internally and be really good at if you’re to be able to deliver your strategy. This section is divided into two: partners and core competencies. Start by defining which partners, distributors, suppliers or other parties are vital to delivering your strategy. Do you already work with these partners or do you have to create the relationship from scratch? If you already work with them, is the relationship healthy? If you don’t already work with them, how will you go about forming that relationship? Then look at your internal competencies in terms of the competencies your organisation needs to execute the strategy successfully. Define whether there are any gaps in your competencies and, if so, how you intend to fill them. Also look at which systems and processes need to change or be improved if you’re to achieve your goals. The aim of this section is to define exactly what resources you need if you’re to execute your strategy properly. This covers IT systems and data, infrastructure, people, talent and cultures; and value and leadership. This means you need to carefully consider a number of questions. For example, what IT systems and data are you going to need? What infrastructure – property, machinery or plant – are you going to need? What are your requirements in terms of talent and people? Do you have the right people and, if not, how will you go about finding them? Do you plan to train your current staff or recruit new people? And finally, what are the key culture and leadership deliverables that will allow this strategy to succeed? This section is frequently missing from strategy documents, yet it’s a key threat most organisations face when implementing their strategies. Therefore, in this panel, you should consider what competition you’ll be facing as you work to deliver your strategy and what risks you may face along the way. Ask yourself, who is your main competition and why? What external factors may threaten your success, be it specific market, regulatory, customer or competition risks? What are the internal financial, operational or talent risks you face? Being aware of these threats before you begin to implement your strategy is the best way to mitigate against them. Remember, strategy doesn’t have to be complicated to be effective. In fact, the easier it is to understand, the more likely it is to be successful. I therefore urge all companies to give the one-page approach a try and create their own SMART Strategy Board.